The SR 520 program is making lots of progress this summer – with 46 pontoons now on Lake Washington and a new Eastside transit stop open for transit riders! Today we also celebrated a new construction milestone on the floating bridge—installation of the first transition span. More details below. Today crews began installing the first of four transition spans for the new SR 520 floating bridge. This first span will connect the new floating bridge with the stationary east approach, south segmental bridge near Medina. This section of the transition span is composed of five steel girders, each 190 feet long, over seven feet tall, and weighing about 45 tons. 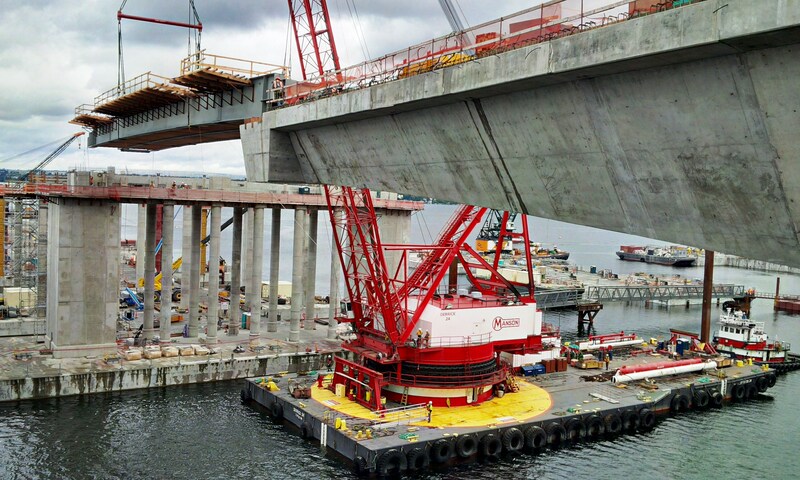 This is a significant milestone for the SR 520 program as this is the first time that a permanent structure will “bridge the gap” between the fixed and floating structures of the new bridge. We held a media boat tour this morning so that media could see this impressive installation. I have attached a graphic and a photo (along with a news release link) so you can see and read more about the magnitude of today’s effort. And here is the link to the Flicker photos. We opened the first of two new median transit stops in SR 520’s Eastside Transit and HOV Projecton Monday, June 16, at Evergreen Point Road in Medina. The ADA-accessible stop, reached by stairs or elevators from the lidded overpass above the highway, is part of the SR 520 program’s eventual build-out of transit/HOV lanes in both directions between I-5 and I-405. We expect to open the Eastside’s second median transit stop, at 92nd Avenue Northeast, in mid-July. That same day, we will open new direct-access ramps for buses and carpools at 108th Avenue Northeast. By late summer, we expect to have all highway upgrades completed on the Eastside, including new roundabout interchanges and a new, regional bicycle-pedestrian path that will cross Lake Washington via the new floating bridge. The new floating bridge continues its march across Lake Washington as crews recently completed joining longitudinal pontoons V to U and U to T. Each longitudinal pontoon is 360 feet long, 75 feet wide, three stories high, and weighs 11,000 tons. In the coming months, crews will align, anchor and bolt together additional longitudinal pontoons as the floating bridge continues to take shape. Attached you will also find the latest Pontoon Tracker that shows the Pontoon status. Earlier this month, crews floated-out eight new pontoons in Tacoma. With this float-out, 60 of the 77 total pontoons needed for the new floating bridge have now been built. The eight new pontoons have been moored at the Port of Tacoma for inspections and will later be towed to Lake Washington to support the new floating bridge. Work has already begun on the final cycle of pontoons being constructed in Tacoma; which are expected to float-out this fall. We appreciate your continued support and involvement in the SR 520 program as we work to build a new, safer floating bridge and improved corridor to support better mobility for the region. Please let me know if you have any questions. 1 Comment on "520 Progress – New Status Report from Chief Engineer"
Seems like poor planning to have lost the stop for Metro route # 271 at the Evergreen Point Road freeway station.